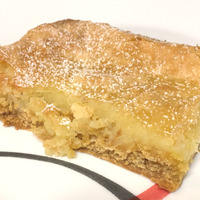 Decadent, fresh-baked Gooey Butter Cake straight from gam-gam's oven. Getchya some. GBC is a St. Louis staple much like cracker crust pizza, toasted raviolis, and culturally segregated racism. It's the preferred weapon of midwestern women looking to mass kill their families via coronary blockage. Confectioner's sugar, yellow cake mix, sugar, eggs, powdered sugar, cream cheese, and more sugar make up this wonderful treat. It's likely the most unhealthy food in existence, which is exactly why it is also the most delicious.. The ol' flavor-health inversion principle. It's science. FW Yellow Cake is my star. It's so good that it's bad for you (and your coils), the true mark of a great flavoring. 3% gives a strong yellow cake flavor and some grainy texture in this recipe. You can sub JF if you realllllly want to, but double the percentage. It will not be the same at all. INW Custard mixes in the eggs and takes the cake texture down to a gooey, batter-esque mouthfeel. 1.25% provides density and amplifies the "yellow" part of the cake mix. LA Cream Cheese Icing is also helping texture. 0.5% stiffens up the gooey texture enough for that gritty, stick-to-your-teeth sweetness. The cream cheese note also fills out the cake mix and custard. OoO Powdered Sugar is a new flavor to me. Thadentman recommended it, and he was right in doing so. At 1.5%, it does powdered sugar better than meringue or torrone could without altering the flavor too much. You get a touch of that dry, powder texture laying throughout the recipe. CAP Super Sweet is needed here. If you've had GBC, you know how insanely sweet it is. I'm not going that far with 0.25%, but I wanna get close. Steeping: It's good fresh, but over the course of a week to two weeks it will come together more. The little bit of Cream Cheese Icing takes some time to do its thing. Fantastic recipe even with JF Yellow Cake. I'm a huge fan of Ooey Gooey Butter Cake dessert and this captures that flavor fantastically. I love the rich full mouthfeel that you get here. I never used INW Custard until I mixed up this recipe and now I find myself using it a lot in my bakery recipes. Great job!! Yummy recipe. Super sweet just like the real thing. Being from St Louis I've had this many times. The powdered sugar is a surprisingly nice finishing touch and the choice of cream cheese and custard for the rich butter element works very nicely with the yellow cake base. This is really great, rich, sweet cake vape. Well done. This recipe is another fantastic creation by Mr. Burgundy. It really makes the FW Yellow cake shine, and turn into a gooey and sugary butter cake. I love the use of OOO Powdered Sugar to add that texture and amplify the sweet note by a thousand. LA Cream Cheese Icing is used low enough that it doesn't stand out at all, and the INW Custard provides an amazing moisture. As the recipe description states, "Getchya some". Winner! Buttery, buttery cake, with some real to life sugary dryness threaded throughout, ending with a moist, lip smacking sweetness. I thought it would be too sweet, but it is not and I can vape it all day long. Perfection. Thank you for sharing this masterpiece.